While whales can be seen year round on the Oregon coast, the winter and spring months are the best times for seeing these enormous creatures. Migration in December and again in late March means higher numbers and a higher viewing success rate. For some of the best sites to spot spouts, we’ve gathered together adventures that will give you the perfect viewing opportunity, as well as some handy tips. On the northern coast of Oregon, there are multiple high points that make good viewing locations for migrating whales. Ecola State Park offers hiking trails with great views over the ocean and of Terrible Tilly, the iconic lighthouse directly off the coast. If the whales aren’t spouting, nearby Indian Beach provides tide pools for a fun afternoon with the family. The crowds at Cape Kiwanda might be an initial deterrent, but hiking up on top of the point helps to weed out some of the masses and allows breathtaking views of the water toward Haystack Rock, Nestucca Bay, and Cape Lookout. We would be remiss if we failed to mention Depoe Bay as a prime whale watching spot. Multiple companies offer whale watching tours from Depoe Bay when the weather and waves are optimal. This may be one of the more guaranteed ways of getting up-close photos of gray whales. You don’t have to pay for a tour ticket to see whales here, though, and there are numerous pull-outs along the highway that give perfect views of the water. For some of the biggest views in the state, Cape Perpetua State Scenic Area is the place to be. Seventy miles of coastline are up for grabs on a clear day, and with optimum conditions you can see more than 35 miles out to sea. That means lots of open water for whale watching! Not to be outdone for scale (though of a different sort), the Sea Lion Caves are considered the largest sea caves in the United States. Privately controlled, there is a day use fee for access to the site. 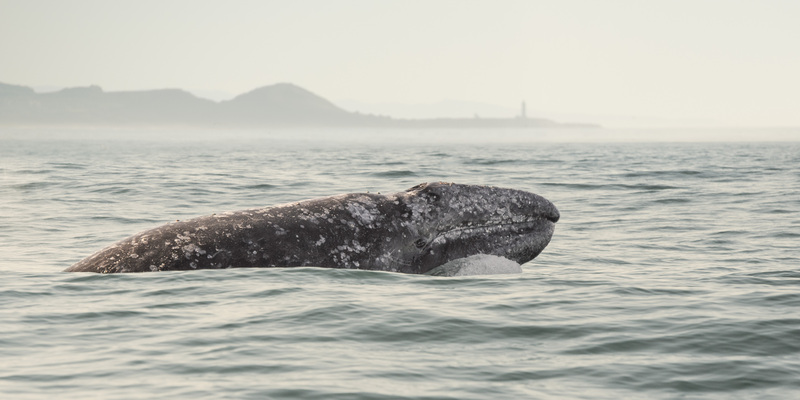 Numerous lookouts provide great opportunities for gray whale sighting. Winter months are also the best time of year to view sea lions! The Umpqua River Lighthouse is one of the prettier lighthouses on the coast with its red and white Fresnel lens, and it is another spectacular spot for whale watching. The lighthouse is listed in the National Register of Historic Places, and the lighthouse staff offer tours to visitors. With far fewer crowds than the northern stretches of coast, the southern coast doesn’t always get the attention it deserves. The Cape Blanco Shore Trail provides some of the most spectacular views in the state with almost no effort required. Binoculars are recommended if you’ll be venturing to Cape Sebastian Lookout because this location is high up and can feel a bit distant from the ocean. The height makes it great for spotting spouts, however. An easy stop along the highway, this is a viewpoint that is accessible for all. For convenient benches overlooking the water, the Cape Ferrelo Lookout trail is a wonderful choice. Pack a picnic lunch and plan to spend a lazy day here on the lookout for whales. Beautiful scenery and the lack of crowds make this a private paradise. Go when the whales are there: Prime viewing is during the winter months and late March. Migrations can number up to roughly 20,000 gray whales during this time of year. Spouts are your friend: Usually you won’t see the fluke or tail unless you’ve taken the extra step of heading out on a tour boat. While occasionally you may get lucky, whale spouts are the most common sighting along the coast. Ask a volunteer: Whale Watch volunteers are great guides to finding whales out in the water. Volunteers are usually available during Whale Week (typically the last weeks in December and March), and offer a ton of information to curious visitors. You can also become a volunteer yourself. Slow down: It’s tempting to try to cover as much water as possible when scanning for whales. Slowing down and moving your eyes gradually across the horizon ups your odds of catching the ephemeral spout. Most importantly: Be patient with yourself! Whale watching is a leisurely activity, often best enjoyed with a picnic lunch and a thermos of hot coffee. Take time to sit in one spot while scouting the water.